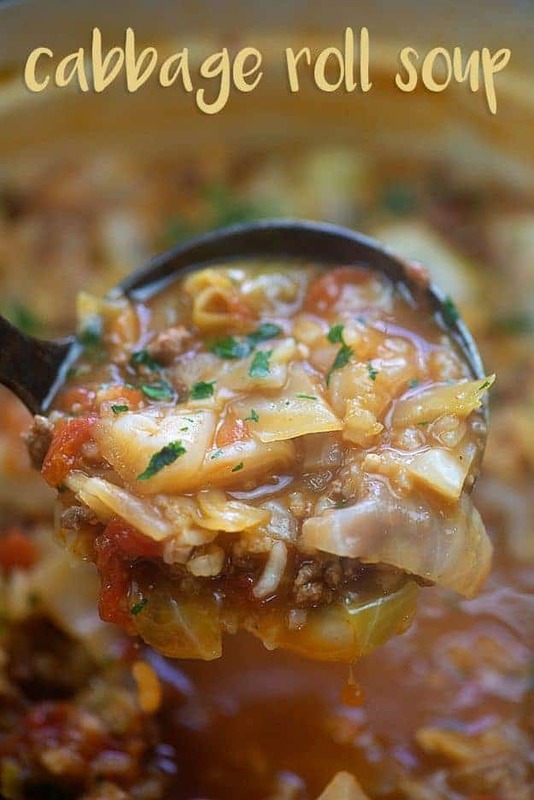 Cabbage roll soup is simple comfort food that feeds a crowd! 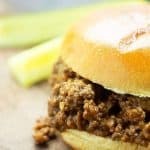 So hearty and filling and totally easy to throw together. We went to Minnesota last weekend to give my son his graduation present. Did I mention that he graduated from high school this past May? He did. I’m pretty proud for a lot of reasons, one of which being that I homeschooled that kid from grade 2 through 12. He’s an amazing kid and he’s now in college with plans of law school in his future. Hold me. Anyway, his graduation present! We took him to Minnesota to drive tanks. He’s a huge history buff with a heavy love for military history. There is a place in Minnesota that has a crapload of tanks and you can go drive them. He could tell you all the specific names of the tanks he drove, but all I remember is the Sherman while I had my little head sticking up out of the hatch. It was fun. And weird. And mostly super freakin’ cold. Apparently, winter comes to Minnesota in October. I am back home in Illinois grateful that we’ll still have (hopefully) another month of 50ish degree weather. Since we all froze this weekend, I thought I’d share a big warm bowl of soup with you guys! 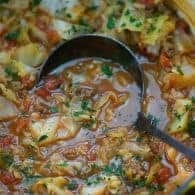 This cabbage roll soup is so hearty and filling and it’s just what the doctor ordered on a cold day. Also, it’s pretty darn cheap and it really is flavorful! 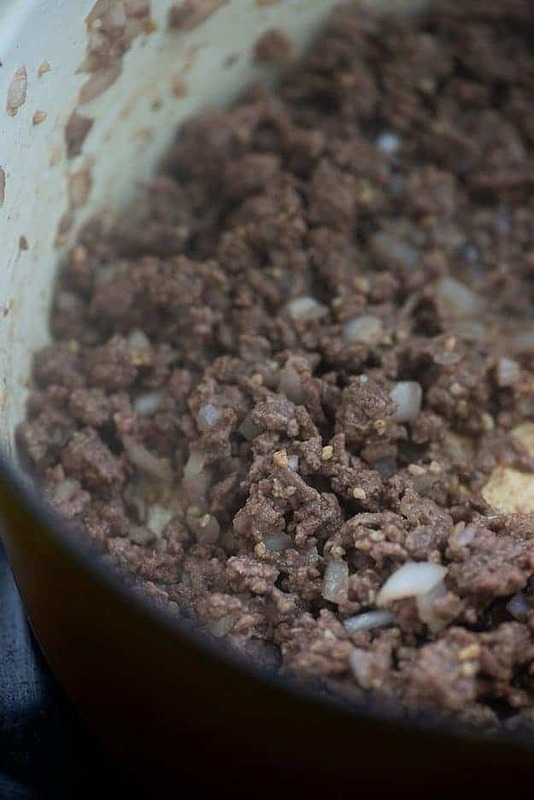 To start, you’ll want to brown some ground beef. Break that up and add in some onion and garlic. Next, you’ll want to chop up a head of cabbage and add that to the pot along with some beef broth, tomato juice, rice, Worcestershire sauce, and my secret ingredient – Ro*Tel! The Ro*Tel adds a little kick to the soup without making it spicy. Just gives it a zing. We love it! You can definitely just used regular canned tomatoes if you don’t want the chiles in there, though. This soup is so easy! Just bring it to a boil, reduce to a simmer, and then cook for about 25 minutes. Once the rice is cooked through, you’re ready to serve. We like to top ours with a little freshly grated Parmesan. What kind of tomato juice should I use in this recipe? You can use straight tomato juice if you like, but I always reach for the V8. 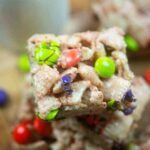 It packs in some extra vegetables without altering the flavor so I feel good about feeding it to my kiddos. If you don’t like V8 or have straight tomato juice on hand, feel free to use that instead. 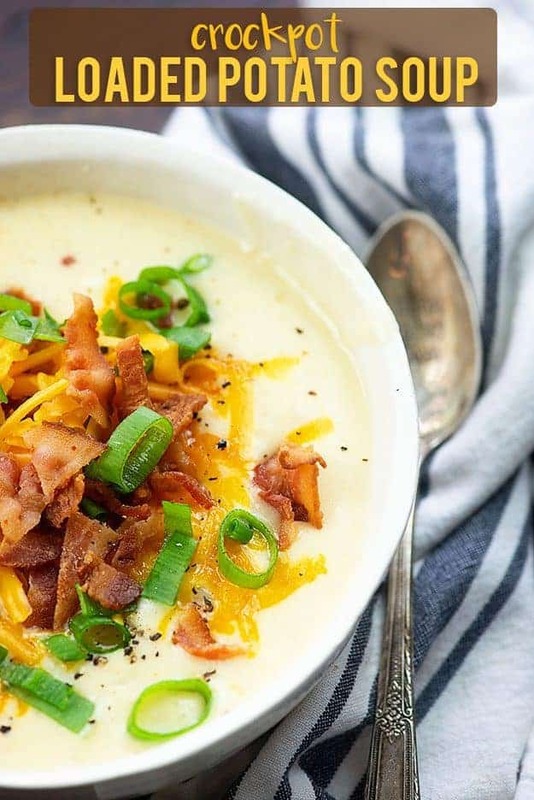 Crockpot Potato Soup: So cheesy and so easy! Chicken Taco Soup: Tacos are my favorite and this chicken taco soup doesn’t disappoint! Cheeseburger Soup: A favorite around here! 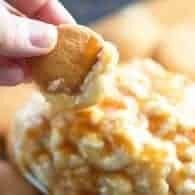 Chicken Pot Pie Soup: I top this with little bits of pie crust in place of crackers and it’s SO GOOD! 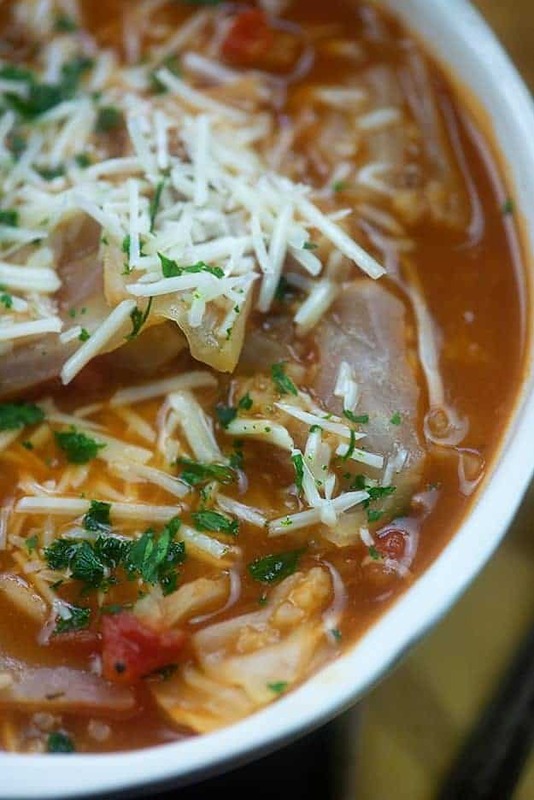 Ham and Bean Soup: The perfect way to use up any leftover ham! 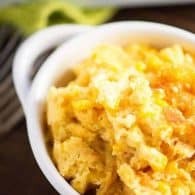 Warm, comforting, and so filling! Add the ground beef to a large stock pot or dutch oven and brown over medium heat. As the meat is beginning to brown, add the onion and garlic to the pan and continue cooking and stirring until beef is cooked through. Add the cabbage, beef broth, tomato juice, rice, Worcestershire sauce, tomatoes with chiles (undrained), and salt to the pot and bring to a boil. Reduce to a simmer, cover, and cook for 25 minutes or until rice is tender. 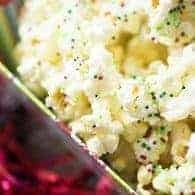 Serve immediately, topped with grated Parmesan, if desired. This is how good soup is made! And, “you can’t make soup without onion and garlic” is a mantra we share. Congratulations on the graduation, I remember how good that felt :). We must be in different parts of Illinois, because it is still jungle sauna season where I am. I am so ready for soup weather — we’ve just been eating it inside in the a/c. This will definitely be on our list for fall though! And as a mom of boys, I definitely see a tank driving excursion in our future at some point. Congrats on having a college student! Jungle sauna season! Ha! It’s been going back and forth between chilly and hot here. 80 today, but 50’s later this week! I’m right outside Peoria – how about you? hmmm………….looks good but how much rice? Congratulations on your son’s graduation, Karly! This sounds like my kind of soup. Although it is almost 90 degrees here 🙁 I could still do with a bowl of that soup! Looks so good! What an awesome graduation gift! My son graduated this year as well and he would so love to drive a tank! This soup looks so warming and delicious. 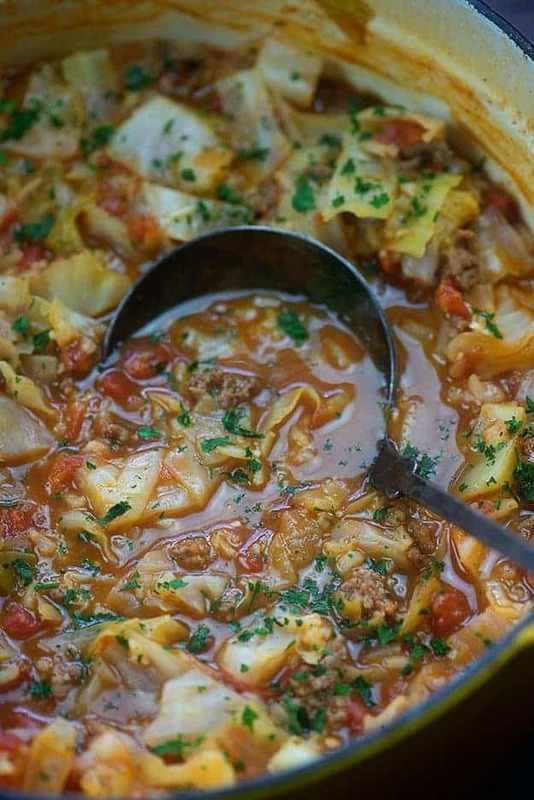 I loved my grandmother’s Hungarian cabbage rolls and to have it in soup form would be so great. I can taste it now! Karly, this soup looks and sounds amazing! I love soup this time of year, and of course, anything with Rotel is fabulous! Thanks for the recipe! Does the rice get gooey in the leftovers? I’m just over here feeding myself, so trying to eat the whole pot of soup in the first try would be…a fun experiment but probably not the best idea. SOUNDS GOOD I KNOW WHAT THE WIFE AND I ARE HAVING FOR SUPPER SOME NIGHT THIS MO. AND CONGRATULATIONS ON THE GRADUATION . Wow! 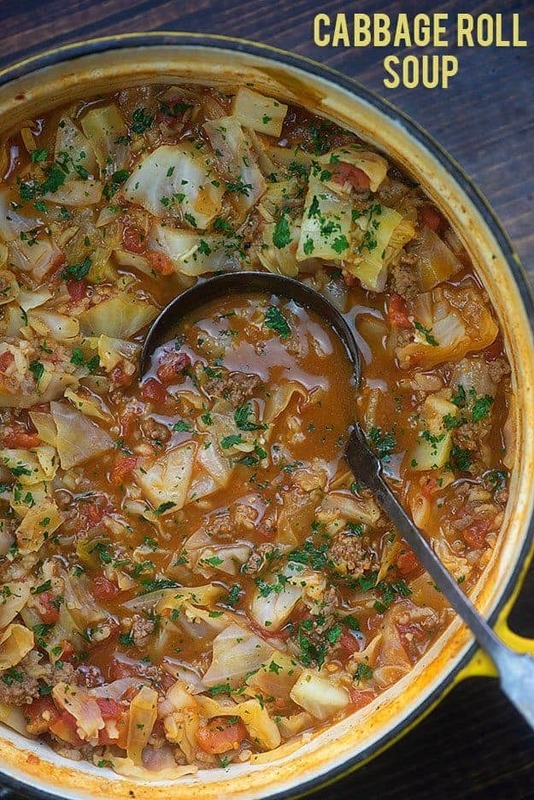 Cabbage rolls are one of my favorite dishes in the world, but I have never had them in the form of a soup. Congratulations to you and your son for the graduation. Homeschooling sounds so scary for us here in Europe, it is not allowed, so we know nothing about it. I cannot imagine being able to do that, especially when it comes to maths and science. Impressive! Looks delicious Karly! And BTW, I learned (at my daughters 90 something degree U of MN orientation a few years back) that Minneapolis is actually hotter in the summer than Milwaukee while colder in the winter! Great soup! I make a very similar one and my whole family loves it! Can you use Chicken broth vs the Beef broth?